Precision Additives' technicians are on-site, across North America, to keep hydraulic fracturing processes optimized day and night. Clients rely on the consistent high quality of Precision Additives' innovative fluid technologies, storage and blending equipment, and on-site fluid management. Precision Additives' proprietary, self-contained frac tanks are delivered to each well site where they are supported by on-site technicians, regional mobile blending units, and QC labs. Precision Additives' commitment to delivering consistent high quality products and services begins in our QA/QC lab and extends to the drilling site. For more than 20 years, Precision Additives has responded quickly to boost operational efficiency for oilfield services companies working in the shale fields across North America and Mexico. 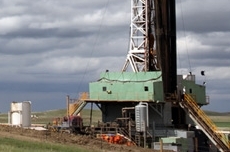 Our primary products include a complete line of drilling, stimulation, and completion fluids. Our track record for safety, quality, and on-time delivery is impeccable. We optimize production processes and costs with innovative, on-site fluid management services backed by our extensive experience in supply chain management, international logistics, and a leadership team with more than 120 years combined experience in the industry. We consistently deliver high-quality drilling, stimulation, and completion fluids, using state-of-the-art, computer-controlled mobile storage and blending equipment. We toll blend, blend private-label formulas, and manufacture proprietary drilling and completion fluids. Download an MS Excel Zip file to Request Product Now. 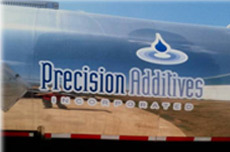 Precision Additives combines its flexible delivery fleet, proprietary frac storage tanks and field service support for maintenance and inventory control at the hydraulic fracturing site to provide comprehensive fluids management. Our engineers, chemists, and lab technicians create proprietary, specialty drilling and completion fluids, then provide on-site QC and QA on raw materials and final products; earning Precision Additives the highest QC classification from multiple Tier 1 oilfield service companies. 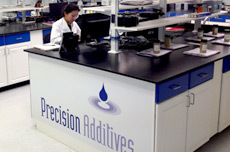 Precision Additives has a 100% on-spec, on-time track record, supported by a world-class logistics and supply chain team. We continue to increase production capacity and recruit and train best-in-class employees to support oil and gas drilling and completion industry demand.